If you’re a fan of films featuring drama, music and romance, then you’ll love these movies like A Star is Born. 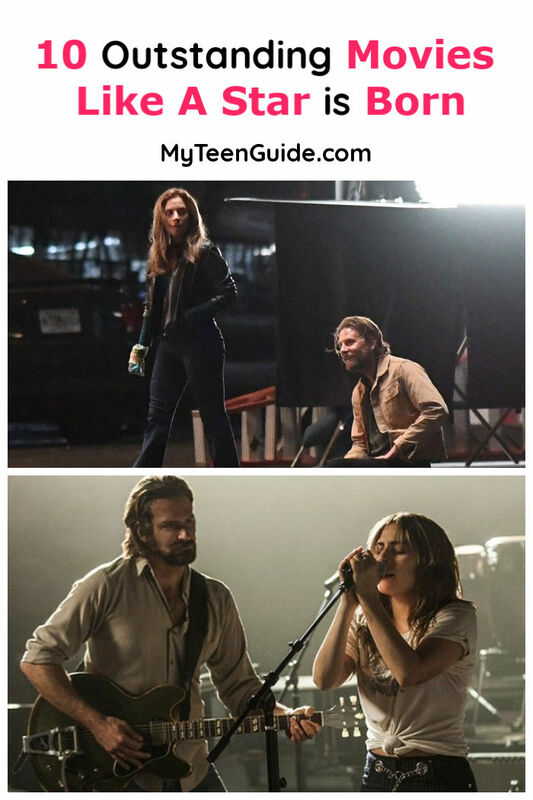 The movie follows Jackson Maine (Bradley Cooper), a seasoned country music artist, who discovers (and later, falls in love with) Ally (Lady Gaga), a struggling young singer. It’s set to hit theaters on October 5, 2018. If you think you’re going to have a hard time waiting until then, check out these music-centric flicks! Glitter is a 2001 drama, musical, romance movie, starring Mariah Carey and Max Beesley. Carey plays Billie Frank, an aspiring, young singer, who meets Julian “Dice” Black (Beesley), a night club DJ. Julian helps Billie to break into the music business and eventually a romance develops between them. When Billie’s career takes off, their romance becomes complicated. (Does this plot sound familiar to you? It is pretty similar to the plot of A Star is Born, don’t you think)? This one didn’t do well with critics, scored a meager 2.1/10 on IMDB and a 7% on Rotten Tomatoes, but it’s still entertaining as long as you aren’t looking for a deep flick. From Justin to Kelly is a 2003 comedy, musical, romance movie, starring Kelly Clarkson and Justin Guarini, both appeared on Season 1 of American Idol. In From Justin to Kelly, Clarkson plays Kelly Taylor, a waitress from Texas, who meets Justin Bell (Guarini), a college student from Pennsylvania. The two meet during spring break and soon develop a relationship, after discovering their shared interest of singing. While this one didn’t do well with critics, earning only 2.1/10 on IMDB and 10% on Rotten Tomatoes, it’s still a fun movie to watch when you just want something sappy and sweet! The Phantom of the Opera is a 2004 drama, musical, romance movie that is based on the 1986 musical by Andrew Lloyd Webber. The movie stars Emmy Rossum and Gerard Butler. Rossum plays Christine Daae, an aspiring soprano singer, who becomes the obsession of The Phantom (Butler), a musical genius who wears a mask to cover his disfigured face. (Okay, if you haven’t seen this movie, it is definitely a must-watch). If you love Shameless, you’ll recognize Emmy Rossum as Fiona! Walk the Line is a 2005 biographical, drama, musical, romance movie that is based on both the 1976 autobiography- Man in Black: His Own Story in His Own Words and the 1997 autobiography- Cash: The Autobiography, both by Johnny Cash. The movie stars Joaquin Phoenix and Reese Witherspoon. Phoenix plays Johnny Cash and Witherspoon plays June Cash. Walk the Line follows the life of Johnny Cash, including his early years, his relationship with June and his rise to country music stardom. Even if you’re not a fan of country music, this is still one of the best movies like A Star is Born. Phoenix and Witherspoon are amazing in it! Dreamgirls is a 2006 drama, musical, romance movie that is based on the 1981 Broadway musical by Henry Krieger and Tom Eyen. The movie stars Jennifer Hudson, Beyoncé Knowles and Anika Noni Rose. Hudson plays Effie White, Knowles plays Deena Jones and Rose plays Lorrell Robinson, a trio of R&B-turned-pop singers (known as The Dream), as they deal with personal and professional struggles. Crazy Heart is a 2009 drama, musical, romance movie that is based on the 1987 novel by Thomas Cobb. The movie stars Jeff Bridges and Maggie Gyllenhaal. Bridges plays Otis “Bad” Blake, an alcoholic, down-and-out country music star, who meets and falls in love with Jean Craddock (Gyllenhaal), a young, aspiring journalist. Audiences and critics seem to love Crazy Heart, giving it a 7.3/10 on IMDB and a high 91% on Rotten Tomatoes. Country Strong is a 2010 drama, musical movie, starring Gwyneth Paltrow, Tim McGraw and Garrett Hedlund. Paltrow plays Kelly Canter, a recovering alcoholic and fallen country music star, who plans to restore her image, with the help of her husband, James Canter (McGraw) and Beau Hutton (Hedlund), a young, rising country music songwriter. I am a huge fan of country music and Tim McGraw is my all-time favorite. You do know who Tim McGraw is, right? Surely you have heard- Live Like You Were Dying, Highway Don’t Care, Humble and Kind)? Begin Again is a 2013 comedy, drama, musical movie, starring Keira Knightley and Mark Ruffalo. Knightley plays Gretta James, a young singer/songwriter, who has a chance encounter with Dan Mulligan (Ruffalo), a disgraced record label executive. The two end up collaborating on producing an album. Scored a 7.4/10 on IMDB and 81% on RT. Broken Bridges is a 2006 drama, musical movie starring Toby Keith, Kelly Preston and Lindsay Haun. Keith plays Bo Price, a fading country music superstar, who returns to his hometown, reuniting with his high school sweetheart, Angela Delton Preston) and meets his teenage daughter, Dixie Leigh Delton (Haun), for the first time. (So, I am a huge country music fan and also a huge Toby Keith fan, so I totally fell in love with this movie). Talk about differences of opinion! This one scored 6.2/10 on IMDB and a lowly 5% on RT! Now, while it scored low on the Tomatometer, audience ratings tell a different story. 86% liked it. Chicago is an award-winning 2002 musical with an all-star cast that includes Taye Diggs, Renee Zellweger, and Catherine Zeta-Jones. The film is about two death row murderesses who become fierce rivals. They are both vying for publicity and the attention of a sleazy lawyer. Chicago scored over 128 award nominations and took home 6 Oscars in 2003. The movie scored a whopping 86% on Rotten Tomatoes, and 7.2/10 on IMDB. Of all these movies like A Star is Born, I have to say that Walk the Line is my favorite. Chicago is also great when you want a full-on musical! Do you have any other favorite musical movies like A Star is Born? Share below!